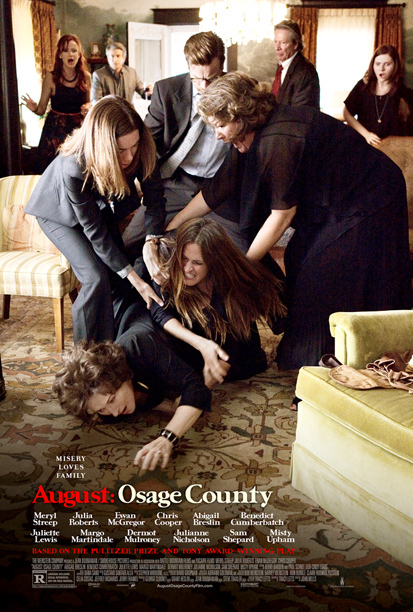 “August: Osage County” is such a good movie they can just title it by the month and county it takes place. Violet (Meryl Streep from “The Iron Lady”) and Beverly (Sam Shepard from “Mud”) have been married for a long, long time. He was once a great poet who is now relegated to caregiver and perennial alcoholic. Violet has a “touch of cancer” but not enough for anyone to feel sorry for her. When Beverly goes missing one day, she has an excuse to be the pill addict she has always been. With Beverly in the wind, her sister and three daughters come home. While Ivy (Julianne Nicholson from “Shadows & Lies”) has stayed in the area, Barbara (Julia Roberts from “Larry Crowne”) and Karen (Juliette Lewis from “Foreverland”) have each moved several states away. These girls do not come home out of love or respect for Violet. They come home because of family, because that is what you are supposed to do. Like most families, this is a group of people you would never hang out with if you were not genetically obligated. Tracy Letts, who wrote the screenplay as well as the play the movie is based on, has such a delicate hand as he slices this family to the core. Director John Wells (“The Company of Men”) exploits this family dynamic in a house with the best porches I have ever seen. The movie is full of wonderful moments and awkward situations. Many of the other great movies of 2013 had some kind of gimmick they were built around, like slavery, outer space or AIDS. Not this movie. There is nothing cool, or hip or edgy here. This movie is about family and how that tree branches off in the most peculiar ways. The dream cast gives the kind of performances we rarely see. The supporting casts all deserve Oscars, especially Margo Martindale (“Beautiful Creatures”) as Mattie Fay, Violet’s sister. You could pick any two characters here and make a movie about them. None of these people are likable, and none of them like each other, but they are family. The dinner table scene reminded me of “12 Angry Men.” Everyone was guilty of something and nobody had all the facts. So for me, the verdict is in, and this great play is now a great movie. Although it may be hard to watch, I can’t find any fault with this movie. Therefore I must give it 5 stars out of 5. As they say in this movie, “We all do things we are not proud of,” but it’s great when it happens to somebody else.